Street Sects continue to redefine the post-industrial canon with their barbed intensity and gunshot-level volume. The Austin, Texas, duo have announced the follow-up to their debut album, a 4-song 12-inch titled Rat Jacket, due out October 6th on The Flenser. Listen to the first single “Blacken The Other Eye” on YouTube. Not quite a follow-up to their 2016 LP End Position, Rat Jacket sidesteps the merciless discord in favor of blacklit post-punk. Still holding fast to their sample-based bedrock, these four new tracks experiment with opulent melodies and organic instrumentation. 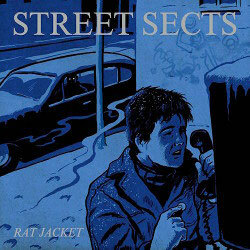 True to Street Sects’ fascination with emotional tumult, Rat Jacket plunges into themes of loyalty, trust, betrayal, paranoia, and man’s innate selfishness. If End Position was a bullet to the head, then Rat Jacket is a knife in the back. Street Sects formed in 2013 after vocalist Leo Ashline emerged from the fog of a thirteen year battle with addiction and began collaborating with friend and multi-instrumentalist Shaun Ringsmuth. Disgusted with life but eager for catharsis, the duo embraced the experimental attitude and disillusionment of early industrial music pioneers, eschewing traditional rock music instrumentation and arrangement in favor of modern sampling technology and harsh electronics. Rat Jacket will be available on vinyl and digital formats on October 6, 2017, via The Flenser.